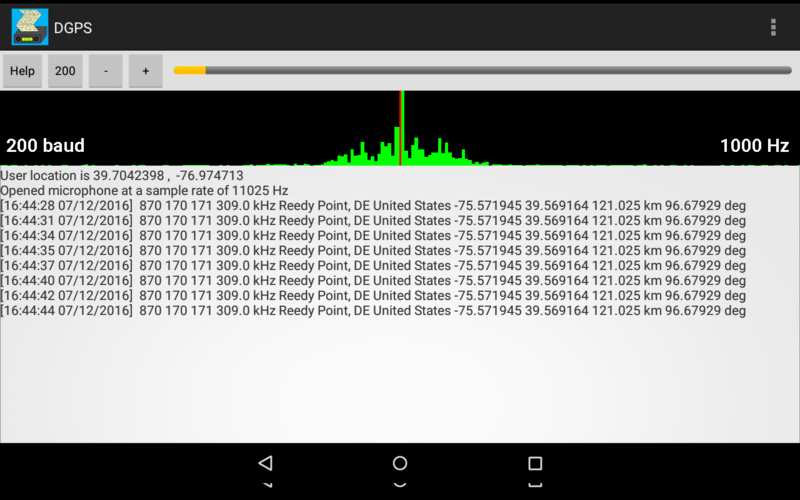 This app can decode DGPS (Differential Global Positioning System) beacon transmissions. DGPS stations transmit the difference between positions indicated by GPS satellite systems and the known fixed position of the station. This allows higher accuracy. DGPS transmissions are 100 or 200 baud and are transmitted on frequencies from 285 kHz to 325 kHz. Hundreds of these stations are operated by the Coast Guard and other agencies, and they can be interesting DX targets. To use this app, you need a radio that can tune the correct frequency range, either in SSB or CW mode. Most "shortwave radios" can do this. Ideally you use a cable to feed the audio from your radio into your device, but you can also place the radio speaker near your device's microphone, or even better yet, plug earphones into the radio, and place them next to the device's microphone. You may need to experiment to get the best quality audio pickup, without any outside noise or distortion. To decode the transmission, tune your radio to a DGPS frequency. You can either tune directly to the frequency in CW mode, in which case you set the center frequency in this app to frequency of the tone produced by your radio in CW mode, usually close to 800 Hz, or use USB mode, tune 1 kHz low, and set the center frequency in this app to 1000 Hz. The app displays an audio spectrum signal plot, the green bars on a black background. Also on this plot, the baud rate and center frequency are displayed on the left and right sides, respectively. Above this, there are several buttons. You've likely already figured out that the Help button brings up these instructions. Next to that is the baud rate button, tapping it toggles between 100 and 200 baud. Next to that are the - and + buttons, they change the center frequency. Finally there is a volume indicator. Ideally the input volume should be between about half way and three quarters. You can also change the baud rate by double tapping on the spectrum, and adjust the center frequency by swiping left and right. When you want to decode a DGPS transmission, select the baud rate, and feed audio into your device. If you don't know the baud rate, try one speed, then the other. 100 baud transmissions have a more narrow bandwidth than 200 baud, eventually you can learn which is which by observing the spectrum display. Eventually, if you have tuned into a DGPS transmission that is strong enough, you will start seeing decode messages printed. That is followed by the assigned frequency, 289.0 kHz for this station. You can compare this value to what your radio is tuned to, they should match. If they don't, then ignore this message, as it was incorrectly received. With weak signals, it is common to receive incorrect messages, because static or other interference has corrupted some of the bits. Just ignore them.